This strategy is the government’s first major contribution to a national conversation on loneliness and the importance of social connections. It sets out government’s long-term ambitions to work with others to build a more cohesive and connected society. Alongside this, it includes a number of initial commitments that benefit both wider society and people at specific trigger points when they are at greater risk of loneliness. The Prime Minister confirmed all GPs in England will be able to refer patients experiencing loneliness to community activities and voluntary services by 2023. The PM also confirmed £1.8m to increase the number of community spaces available – the funding will be used to transform underutilised areas, such as creating new community cafes, art spaces or gardens. This new funding builds on £20m announced in June to help charities and community groups expand their programmes which bring people together to benefit communities. 2018. 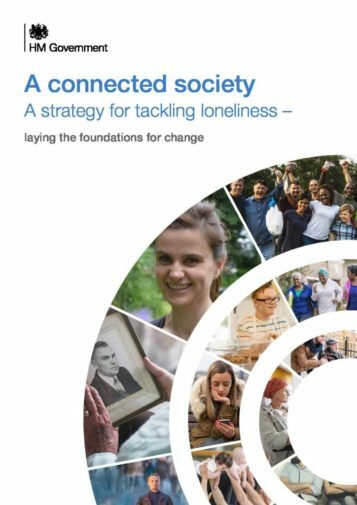 A connected society: A Strategy for loneliness - laying the foundations for change. UK:DCMS.